1175 1175 0% off in Rs. Plasticization of the raw material in granule or powder form. Metering for the plasticised product through a die which converts it to the required form (i.e. tubular or flat). Solidification into the required form. Processes (1) and (2) are carried out in the extruder, whilst (3) and (4) are ancillary processes. 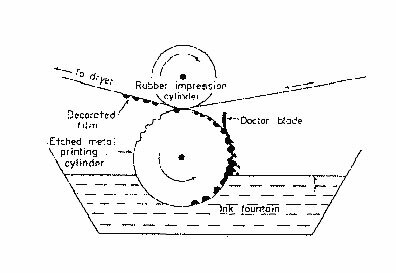 A typically extruder is shown in figure 1 and consists essentially of an Archimedean screw which revolves within a close fitting, heated barrel. The plastics granules are fed through a hopper mounted at one end of the barrel and carried forward along the barrel by the action of the screw. As the granules move along the screw, they are melted by contact with the heated walls of the barrel, and by the heat generated by friction. The screw then forces the molten plastic through the die which determines its final form,. The most important component of the extruder is the screw are used for extruding different polymers. Extruder screws are characterised by their length to diameter ratio(commonly written as L/D ratio) and their compresison ratios. The compression ratio is the ratio of the volume of one flight of the screw at the hopper end to the volume of one flight at the die end. L/D ratios most commonly used for single screw extruders are between about 15:1 to 30:1, while compression ratios can vary from 2:1 to 4:1. An extruder screws is usually divided into three sectors, namely, feed, compression and metering. The feed section transports the material from under the hopper mouth to the hotter portion of the barrel. The compression section is that section where the diminishing depth of thread causes a volume compression of the melting granules. 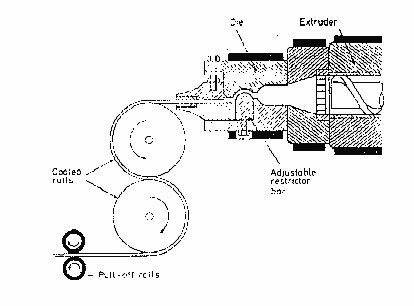 The main effect of this is an increase in the shearing action on the molten polymer due to the relative motion of the screw surface with respect to the barrel wall. This improves the mixing and also leads to an increase in frictional heat and a more uniform heat distribution throughout the melt. 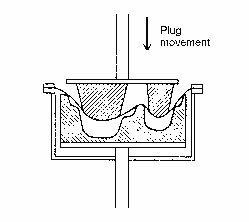 The function of the final section of the screw is to homogenize the melt further, meter it uniformly through the die and smooth out pulsations. Just prior to the die is fitted a breaker plate supporting screen pack consisting of a number of fine or coarse mesh gauges. The screen pack filters out any contamination which might be present in the raw material. This is particularly important in the case of thin film extrusion where even the smallest of contaminating particles could cause holes or even breaks in the film. The screen pack also increases the back pressure in the extruder and this improves the mixing and homogenisation of the melt. The above description has been based on a single screw extruder but multi-screw models are also available giving more positive transport of the molten polymer and more efficient mixing. 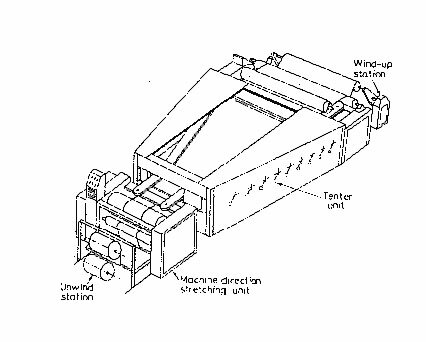 A typical set-up for blown film extrusion is shown in figure-2. In this instance the molten polymer from the extruder enters the die from the side but entry can also be effected from the bottom of the die. 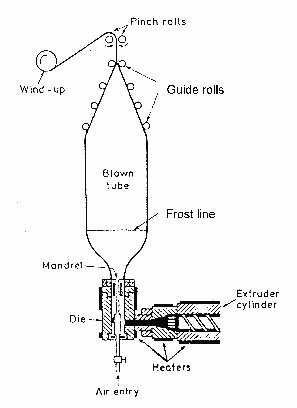 Once in the die, the molten polymer is made to flow round a mandrel and emerges through a ring shaped die opening, in the form of a tube. The tube is expanded into a bubble of the required diameter by an air pressure maintained through the centre of the mandrel. The expansion of the bubble is accompanied by a corresponding reduction in thickness. Extrusion of the tube is usually upwards but it can be extruded downwards, or even sideways, the bubble pressure is maintained by pinch rolls at one end and by the die at the other. It is important that the pressure of the air is kept constant in order to ensure uniform thickness and width of film. Other factors that effect film thickness are extruder output, haul-off speed and temperatures of the die and along the barrel. These must also be strictly controlled. As with any extrusion process, film blowing becomes more economical as speeds are increased. The limiting factor here is the rate at which the tubular extrudate can be cooled. Cooling is usually achieved by blowing air against the outside surface of the bubble. 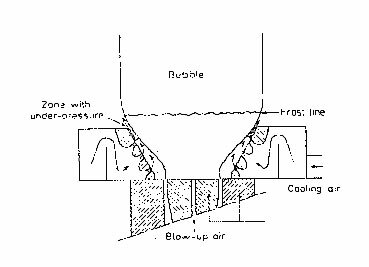 Under constant air flow conditions an increase in extrusion speed result in a higher 'frost' line (the line where solidification of the extrudate commences) and this leads to bubble instability. Increasing the air flow gives more rapid cooling and lowers the 'frost' its application because too high a velocity of the air stream will distort the bubble. 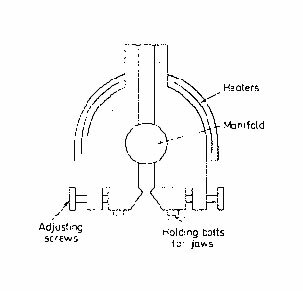 Various designs of air cooling rings have been worked out in order to produce improved cooling without these attendant difficulties and one such design (designed and patented by shell) is shown in figure.3. It consists of a conically shaped ring provided with three air slits, the airstreams from which are so directed and regulated that the space between the bubble and the ring decreases gradually towards the top of the ring. This gives improved cooling by increasing the speed of the air stream. The design also results in a zone of under-pressure at the top of the ring and this greatly improves the bubble stability. Blown film extrusion is an extremely complex subject and there are many problems associated with the production of good quality film. Among the many defects which can occur are variations in film thickness, surface defects such as 'orange peel', 'apple sauce' of 'fish eyes', low tensile strength, low impact strength, hazy film, blocking and wrinkling. Wrinkling is a particularly annoying problems because it can be costly, leading to scrapping of a roll of film, and because it can arise from such a wide variety of causes that it is likely to occur even in the best regulated extrusion shop. If the film is too cold when it reaches the pinch rolls, for instance it will be stiff and this may cause crimping at the nip and wrinkling. One way of raising the film, temperature at the nip rolls is to raise the melt temperature but this can lead to other troubles such 'as blocking. In fact, this is illustrative of the whole subject of film blowing inasmuch as compromises are often necessary to achieve the best balance of properties. Wrinkling can also be caused by the die gap being out of adjustment. This causes variations in film thickness and can lead to uneven pull at the pinch rolls. Another cause of wrinkling may be surging from the extruder or air currents in the extruder shop. Both of these factors can cause wobbling of the film bubble and thus wrinkling at the wind-up stage. The film bubble may be established by supporting it with horizontal stationary guides or the whole extruder may be protected from stray air currents by a film curtain. Other causes include non-alignment of the guide roll and the pinch rolls, or non-uniformity of pressure across the face of the pinch rolls. Among the surface defects mentioned earlier, 'fish eyes' are due to imperfect mixing in the extruder or to contamination. Both of these factors are controlled by the screen pack which not only screens out contaminating particles but improves homogeneity by increasing the back pressure in the extruder. 'Orange peel' or 'apple sauce' are also surface defects caused by inhomogeneity of the molten polymer. Since low density polyethylene forms by far the greatest percentage of all film made, it will be useful to consider the influence of the various polymer parameters such as metal flow index and molecular weight on the film properties. Impact strength, for instance, increases with molecular weight (i.e. decreasing melt index and with decreasing density. Heavy duty sacks, for instance, are normally made from polyethylene grades having densities between 0.916 and 0.922 g/cm3 and melt indices between 0.2 and 0.5. For thinner technical film as used in building applications or waterproof lining of ponds, higher melt indices have to be used because of the difficulty of drawing down very viscous melts to thin film. Melt indices of between 1 and 2.5 are more useful, therefore, and impact strengths are less than for heavy duty sacks. Clarity is, however, improved. Where a good balance of properties is required as in the medium clarity/medium impact grades, slightly higher densities are used (0.920 to 0,925 g/cm3) and the melt index is varied between 0.75 and 2.5. For high clarity, a high density and a high melt index are required since increases in both these properties cause an increase in see-through clarity, a decrease in haze and an increase in gloss. High clarity film will, of course, have a relatively poor impact strength because of the high melt index and such film should not be used for packaging heavy items. 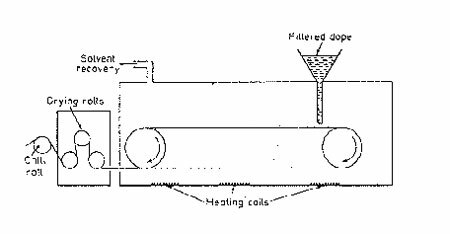 In flat film extrusion the molten polymer is extruded through a slit die and thence into a quenching water bath or on to a chilled roller. In either case the essence of the process in rapid cooling of the extruded film and cooling is, therefore, applied within a very short distance of the die lips (usually between 25 and 65 mm,). This short distance is also dictated by the necessity to reduce 'necking' of the film web, with consequent loss of width. In the chill roll casting method, the melt is extruded onto a chromium plated roller, cored for water cooling. The rapid cooling leads to the formation of small crystallites and this gives a clearer film. Where the quench bath method is used, the water temperature should be kept constant for best results. At constant extrusion temperature, lower quench temperatures, improve slip and antiblocking properties while higher quench temperatures give film that is easier to wind without wrinkles and with better physical properties. 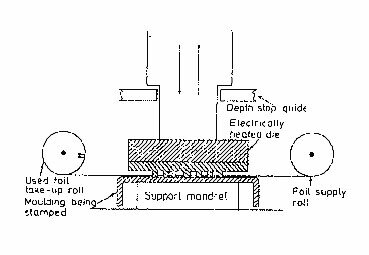 Slit-dies for flat film are wide in comparison with the diameter of the extruder head and this means that the flow path to the extreme edges of the die is longer than to the centre. Flow compensation is usually obtained by a manifold die, a cross-section of which is shown in figure. 5. It consists of lateral channel (or manifold) of such a diameter that the low resistance is small compared with that offered by the die lips. The manifold can only be efficient in its task of flow compensation if the viscosity of the melt is fairly low so that higher temperatures are necessary for flat film extrusion. This limits the use of the manifold die to materials of good thermal stability while another consequence of the higher extrusion temperature is the necessity for a heavier screen pack in order to maintain satisfactory back pressures. The inside surface of flat die has to be precision machined and well polished since the slightest surface imperfection will result in striations or variations in gauge. the mechanical properties of the film are generally better than those of cast film. The width of lay flat film is easily adjustable and there are no losses due to edge trimming. This latter is necessary for flat film because of the thickening of the film edge due to necking-in. Lay flat film is more easily converted into bags since it is only necessary to seal one end of a cut length to make the bag. The cost for making wide blown film is much lower than for wide cast film because the cost of chill rollers increases rapidly with width due to the difficulty of precision grinding longer rollers. A tubular film die is more compact and is cheaper than a slit-die producing film of comparable width. The tubular process is easier and more flexible to operate. Very high outputs can be obtained by slit-die extrusion units. Slit-die film normally has superior optical properties but it should be noted that special rapid cooling processes have been developed for tubular film, particularly in the case of polypropylene film. One example, the shell Tubular Quench Process, will be described in more detail later. Thickness variation is usually less with slit-die extruded film. Among the advantages of the air-cooled tubular process mentioned above were cheapness, case of conversion into bags and flexibility of operation. These factors have been largely responsible for the large scale penetration of low density polypropylene film into packaging markets. Polypropylene cannot be processed on the same equipment since the rate of cooling is inadequate to prevent the formation of large ' spherulites' (crystalline aggregates) in the film. This leads to the production of a brittle film having a matt, opaque appearance. Clear polypropylene film can be produced by chill roll casting techniques but the equipment is expensive and is not normally economic at outputs below about 600 tons per annum. This has greatly hindered its penetration of the clear film packaging market. Techniques of water cooling tubular polypropylene film, however, have opened up ways of producing clear film, with greater toughness and at no greater cost than cast polypropylene film. Among the different techniques commercially available is sheil's. 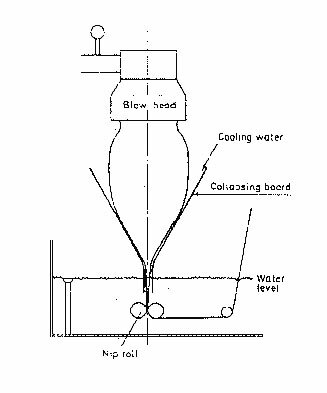 Tubular Quench (TQ Process) which involves downward extrusion of a tubular extrudate from an annular die followed by rapid cooling on water-covered converging boards. At the same time the tubular extrudate is inflated with air in the normal way to give film of the required lay flat width and thickness. The water film that runs down the converging boards shock cools the film and causes rapid crystallite formation and hence the formation of small spherulites with a consequent increase in clarity. The layout of the TQ Process is shown schematically in figure. 6. As with polyethylene, the blow up ratio influences the balance of molecular orientation between machine and transverse directions and this affects film impact strength, tensile strength and tear strength in the usual manner. The properties of TQ polypropylene film are similar to those of the cast film. However, the ability to vary the blow up ratio allows a measure of control over the molecular orientation and this in turn can result in an improvement in mechanical properties compared with cast where the orientation is essentially all in the machine direction of the film. The degree of orientation in the TQ process is still low compared with that of true biaxially oriented film and TQ film does not compete with it in properties. The production of biaxially oriented film will be dealt with later but a comparison of polypropylene film produced by chill roll casting, the TQ Process and bixial orientation is given in table 1. The TQ process is particularly valuable for outputs of film below the economic output of a cast film line (up to about 600 tonnes per annum). Costs are much lower and benefit from the great flexibility of the blown film process and the absence of edge trim waste. Another process is the Dow-Taga process. In this the blown film goes through a hollow ring where it is coated with a film of water which flows from the ring and on to the film before it is collapsed. Different sizes of rings must be used to match changes in blow up ratios whereas with the TQ process, no changes in equipment are needed when making different diameters of tubular film. In a third process, developed by Kokoku Rayon and Pulp Co. Ltd. In Japan (now the Kohjin Co. Ltd.), the tube of polypropylene film, after it comes out of the die, is passed over a mandrel that extends down into a water bath. After cooling, the film comes out of the bath, still in tubular form. It is then dried and the tube collapsed between a set of rolls. Calendering is a process for producing film or sheet by feeding a plastics mass into the nip between two rolls where it is squeezed into a film which then passes round other rolls. It emerges as a continuous film, the thickness of which is governed by the gap between the last pair of rolls. The first stage of a calendering process is the compounding of the plastics mix fed to the calender rolls. Where polyethylene is being calendered, the mix may be a simple hot melt but in the case of PVC (which is the polymer most commonly converted by calendering) the procedure is more complex. One method is to pre-mix the polymer in a ribbon blender with stabilizers, plasticizers, etc, and then pass the blend to an internal mixer where the mass is gelled for about 5 - 10 min at about 120- 160Â°C. The gelated lumps so formed are made into a rough sheet on a two-roll mill and the sheet fed to the calendar. Calendars may consist of from two to five hollow rolls (or bowls) arranged for steam heating or water-cooling and are characterised by the number of bowls and their arrangement as, for example, I, Z or inverted L types. Four roll, inverted L and Z types are the most usual. The rolls can be 'crowned', i.e. they can be made with a greater diameter at the center than at the end. The rolls can be crossed slightly, thus increasing the nip opening at either end of them. A bending moment can be applied to the ends of each roll by having a second bearing on each roll neck and these are then loaded by hydraulic cylinders. Z types have the advantage in this respect because bending of the rolls have no effect on the succeeding nip and so improves thickness accuracy. This is because alternate rolls are at right angles. Calenders are of massive construction because of the large forces necessary to squeeze the plastics mass into a thin film. They call for high temperatures, with little tolerance across the rolls and high pressure, again with low tolerances. A large floor area is also needed because of the associated plant such as mixers, blenders, temperature control systems, haul-off equipment and other ancillary plant. Calendering is, therefore, a capital intensive process and calenders tend to cater for wide width film (around 1.8 m wide) because the cost is obviously proportionally less. However, these large machines tend to be used only for plasticised PVC because unplasticized has a much higher melt viscosity which makes it harder to handle on rolls of this width. A special calendering process known as the Luvitherm process was developed, therefore, to produce unplasticised heated PVC films. The PVC is flash up to 220Â°C while in contact with a specially designed aluminium roll and the hot film produced is normally oriented immediately after calendering in the high temperature zone. The calender unit is narrower than the large units described earlier and the output is lower. Special grades of PVC are used, with special stabilizers, and the compounding stage can be an extruder compounder feeding direct to the calender. Calendering usually produces film with a better uniformity of gauge compared with that obtained by extrusion. A number of factors contribute to this, one of which is the great care paid to the engineering of the calendar bowls (as mentioned earlier). The final gauge is very much dependent on the gap between the final two bowls whereas in extrusion the gauge is dependent more on blow-up ratios (in the case of tubular film) or draw down speeds ( in the case of slit-die film). In addition, in an extruder cross-head die there may be a range of path lengths which lead to preferential flow and induce variation in gauge. In the tubular die process there are complicating factors such as the structures supporting the mandrel in the die. This also has an effect on the melt flow, leading to gauge variations. Another advantage of calendering is that better mixing is obtained. The amount of energy available in a calendering line is very much more than in an extrusion line, so calendered film is less dependent on the uniformity of the feedstock. The main advantage of extrusion for PVC is the much lower capital costs involved, so that shorter runs can be made at economic rates. Solvent casting methods are expensive but cellulose nitrate film was made in this way because of the flammable nature of the film. A casting solution prepared by dissolving cellulose nitrate and camphor (as plasticizer) in a 70:30 ether/alcohol mixture using paddle mixers. After 8 - 10 h mixing the products filtered through cellulose wadding and de-aerated in vacuo at a temperature just under the boiling point of the solvent. The film casting is carried out on an endless belt, a smooth surface being obtained by depositing a layer of hard gelatine on a copper support. After being stripped from the casting surface the film is seasoned in a heated drying cabinet where it passes over a zig zag pattern of rollers. After a final passage over chilled rollers to cool the film, it is wound into reels. The general lay-out of a film casting process is shown in figure. 7. Some cellulose acetate film is produced by solvent casting, as well as by extrusion, and solution casting has also been used for producing vinyl/acetate copolymer films. Methods of dissolving and then regenerating cellulose date back to 1857 but the one which is the basis for the modern cellulose film was discovered by Cross, Bevan and Beadle in 1892. It was not until 1911, however, that Brandenberger patented the continuous manufacture of cellulose film. Uses for the film were restricted at first because of its high moisture vapour permeability but the development in 1927 of moisture proof grades opened up many new markets and cellulose film is still an important packaging material. The basic raw material, cellulose, is obtained from wood pulp or cotton linters. After soaking in caustic soda for an hour, the excess alkali is pressed out. It is then shredded and allowed to age for 2-3 days and absorbs oxygen from the air. This reduces the length of the cellulose molecule chain and so reduces the viscosity of the solution during the next stage. Here the pulp is transferred to rotating churns and then sprayed with carbon disulphide. The solution is discharged into a tank and dispersed by stirring with dilute caustic soda solution. The resultant solution is known as viscose. Cellulose film is made by filtering the viscose solution and allowing it to 'ripen' for 4-5 days. The ripening process consists of a slow hydrolysis, the progress of which is followed by taking viscosity measurements. If ripening goes too far a gel is formed which is useless. Air bubbles in the solution are removed by drawing a metal band, which revolves in the first of a series of tanks. The thickness of the film is regulated by varying the orifice at the base of the casting hopper or reservoir. The first tank contains the coagulating solution consisting of sulphuric acid and sodium sulphate at a temperature of about 40Â°C. This solution not only coagulates the viscose but initiates its regeneration back to cellulose. The coagulated film is then led through further tanks by means of guide rolls. The tanks contain various solutions designed to complete the regeneration, wash out acid carried over from the coagulating bath, remove any elemental sulphur, carbon disulphide, hydrogen sulphide, etc., and bleach the now transparent but still slightly coloured film. The film is then run through a bath containing glycerol or ethylene glycol which at as plasticizer and confer flexibility on the film. Finally it is passed through a drying oven and reeled up. At this stage, the film is extremely permeable to moisture vapour and is not heat sealable and a subsequent coating treatment must be given if moistureproofness or heat sealability are required. A typical coating consists of dibutyl phthalate-plasticized cellulose nitrate, together with waxes and natural resins dissolved in organic solvents. Urea formaldehyde is also incorporated to anchor the coating and prevent it from floating off in damp conditions. The film is passed through the coating bath dried to evapourate the solvent then passed through a high humidity chamber to restore the flexibility. Where even better barrier properties are required, a coating of polyvinylidene chloride is applied. Orientation of film by stretching it under heat is widely applied to films such as polypropylene, polystyrene nylon and polyethylene terephthalate to improve clarity, impact strength and, particularly in the case of polypropylene, its barrier properties. Basic polystyrene film, for instance, in its non-oriented form is very brittle and has only a limited use as a dielectric in capacitors. When biaxially oriented (i.e. oriented in two direction at right angles), the film is quite tough and can be thermoformed into crystal clear tubes, trays and larger items such as cake covers. The largest application of orientation techniques, however, is in the manufacture of polypropylene film and the various processes will be illustrated mainly with respect to this film. The main processes can be divided into linear and tubular. The principle of the linear type can be illustrated by considering the two stage process shown in figure 8. Thick cast film of around 500-600mm thick is made by the chill roll casting process described earlier in the chapter. This is then fed to a system of differential draw rolls, i.e. rolls running at gradually increasing speeds. These rolls are heated sufficiently to bring the film to a suitable temperature (below the melting point). Under these conditions, the films is stretched in the machine direction at a draw ratio which is normally between 4 : 1 and 10 : 1. After leaving the draw roll, the films is fed into a tenter frame which consists of two divergent endless belts or chains fitted with clips. These clips grip the film so that as it travels forward it is drawn transversely at draw ratios similar to those applied in the machine direction. The tentering area is also heated, with accurate control of temperature, usually by passing the film through an oven. On leaving the tenter frame, the films is cooled by passing over a cooling roller, then reeled up. Systems are also available in which this sequence of operation is reversed, i.e. the tenter frame comes first, followed by the differential draw rolls. The two operations can also be carried out simultaneously, as in figure. 9. The film is gripped by its edges as it leaves the casting rolls and is then moved forward at an increasing speed while being stretched transversely by the diverging grips. Mechanically, this type of operation can be carried out by a tenter frame in which the clips are moved by a screw of increasing pitch. The magnitude of the transverse draw would then be controlled by the angle of divergence of the clips, in the usual way, while the magnitude of the forward draw would depend on the rate of increase of pitch. As indicated, orientation can also be achieved by tubular processes. Molten polymer is extruded from an annular die and then quenched to form a tube. The wall thickness of the tube is controlled partly by the annular die gap and partly by the relative speeds of extrusion and haul-off. The tube passes through slow running nip rolls and is then re-heated to a uniform temperature. Transverse drawing is achieved by increasing the air pressure in the tube, the draw ratio being adjusted by adjustment to the volume of entrapped air. The air is trapped by pinch rolls at the end of the bubble remote from the extruder and these are run at a faster speed than the first pair, thus causing drawing of the film in the machine direction. The tubular process is thus another method of obtaining simultaneous transverse and forward orientation. A range of films is obtainable from the various methods, from a biaxially oriented film with balanced properties, i.e. the same draw ratio in each direction, via biaxially oriented film with unbalanced properties (different draw ratios in the two directions), to completely uniaxially oriented film (either in the machine direction or transversely). Uniaxially drawn films tend to fibrillate when stretched at right angles to the direction of orientation and this reduces their usefulness as packaging film. If oriented polypropylene film is heated to about 100Â°C immediately after drawing, it will shrink unless it is restrained in some way. This can be prevented by a process of annealing or heat setting. The film is heated, under controlled conditions, and while held under restraint. After cooling, the film will not shrink if heated to below the annealing temperature and the films is said to be heat set. The physical and optical properties of the film remain unchanged. Reducing the density of polymer by the creation of a cellular structure give articles having a greater stiffness in bending for a given weight of polymer. The technique can be applied to extruded films as well as to moulded articles and has been so applied in the case of polystyrene and, more recently, the polyolefin's. The greater rigidity for a given weight of material is achieved because the rigidity of a beam is proportional to the cube of its thickness. For unit surface area, therefore, a film of double the thickness can be made from Xg. of material if the density is halved. Doubling the thickness means an increase of two cubed, = eight, times the stiffness for a given modulus but the modulus, giving a net increase of four times the stiffness. This can have very important economic advantages. There are two main methods for the production of expanded polystyrene film. The first of these starts with polystyrene beads which have been impregnated under pressure with a liquefiable gas, usually pentane. The film is blow extruded, using a twin screw extruder and the addition of a nucleating agent such as a citric acid/sodium bicarbonate mixture. The nucleating agent has been found to be necessary in order to give a fine cell size. As the molten mass leaves the extruder die head and the pressure is released, the material starts to expand. The blown bubble technique is used in order to take up the corrugations which occur during the expansion process. The bubble is normally blown horizontally for ease of handling during start-up since the material is hard and rigid, unlike polyethylene film. When the bubble is collapsed, the tube is cut at each side to give two flat sheets which are reeled up separately. This is necessary because the folded edges of the tube are a source of weakness due to the rigidity of the polystyrene. The other method utilises ordinary polystyrene beads as feedstock and gassing is carried out in the extruder. The film is then blown as before. The extruder has to be constructed specially for this type of operation and it is only economically viable for large tonnage offtakes-of the order of 400 tons/annum. The extrusion of pre-gassed beads is cheaper at lower tonnages and has the advantage of flexibility since the extruder can be used for other work. Control of sheet orientation in either operation is achieved, as usual, by adjusting the haul-off speeds and the blow-up ratio. The orientation should be as balanced as possible as any appreciable difference in strength between machine and transverse directions could lead to splitting of the sheet during subsequent thermoforming operations. The density of the sheet as it leaves the extruder is usually about 80 g/l (5 lb/ft3) but subsequent operations, such as blowing-up and any stretching that occurs during haul-off, compress the sheet and so increase its density. The collapsing of the bubble and subsequent passage of the films through nip rollers also increases the density. Where low density sheet is required it is passed under an infra-red heater just prior to reeling up. These are made by adding a master batch to the normal granules and then blow extruding as usual. The master batch contains a blowing agent and processing aids. The blowing agent is a compound which breaks down at the temperature of extrusion to give nitrogen which expands the molten mass on extrusion. When the melt leaves the high pressure zone in the die, the gas diffuses to discontinuities in the melt and bubbles are formed. In expanding the melt the gas has to stretch the polymer in order to create a cell. The melt temperature has to be carefully controlled at this point, therefore, because it affects the melt strength. Films produced in this way have some of the attributes of paper, e.g. appearance, handle, stiffness and some retention of creasing. Densities are of the order of 600 g/1. Nets are usually made by the knitting of mono- or multi - filaments or by direct extrusion processes giving nets with the crossing strands fused together at the point of contact. It is also possible to produce a net from film by embossing and then stretching. The films splits in a regular manner and an open work pattern is produced,. The technique is applicable to a large number of polymers, while other variables are the embossed pattern and the loading conditions. Outlets so far are in the surgical and medical fields, in dressings, and as adhesives between two layers of cloth which are fused together by heat. The regular spacing and porosity of the net remain while the laminated materials aquire excellent drape and resistance to washing or dry cleaning. Films used for packaging are often required to be printed either as a means of brand identification or to impart instructions for opening the pack or using the contents, or to enhance the sales appeal of the package. Excellent results are now obtainable on most plastics film but it is very rarely possible to use the same inks and printing methods as are used for paper. Films such as the polyethylenes, polypropylene, EVA, etc., have to be pre-treated before printing in order to obtain satisfactory adhesion between the ink and the plastic. This is because their inert, non-polar surfaces do not permit of any chemical or mechanical bonding between them and the ink. From the above it can be seen that the object of pre-treatment is to produce a surface on the plastic film to which the ink can key. There are various processes but they are usually aimed at oxidising, the surface in some way. Pre-treatment methods include solvent, chemical, flame and electrical treatment but the last method is by far the most common one in commercial use. The method makes use of the swelling and partial solvent effect of certain hot organic liquids such as toluene or the chlorinated hydrocarbons, and is followed by hot air drying. It is more suitable for thicker sections such as injection or blow moulded articles but also has the general disadvantage that efficient vapour extraction plant is necessary. 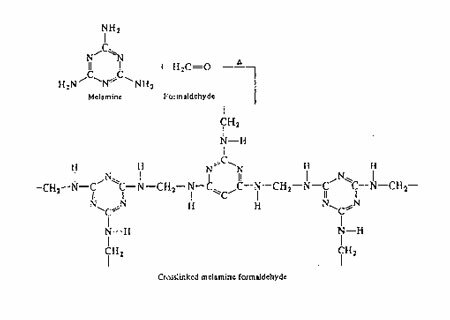 These methods are based on the use of strong oxidizing agents, such as chromic acid, which attack the polymer surface to form carbon-oxygen bonds. The method is obviously a messy and dangerous one and is little used except for small numbers of awkwardly shaped mouldings which might be difficult to treat evenly by flame or electrical methods. This was one of the earliest methods for pre-treating film but is now more commonly used for bottles. In essence it consists of exposing the surface of the polymer to an oxidizing flame for a short period of time, in the range 0.2-3.0s. For films, the time would obviously be in the lower end of the range. Once again, carbon-oxygen bonds are formed, rendering the surface wettable and able to form an adhesive bond between the ink and the plastic. This method has gradually displaced flame treatment as the preferred method for films because their thin gauge makes is difficult to control the extent of flame treatment. Treatment is normally in-line with extrusion of the film. This is an advantage when anti-static and other additives are present because the film treatment can be carried out before the additives have had a chance to bloom to the surface and so upset the evenness of the process. The film is passed between two electrodes, one of which is a metal blade connected to a high-voltage (10-40 k V), high frequency (1-4 kHz) generator. The other electrode is an earthed roller and is separated from the high voltage electrode by a narrow gap of about 1Â½-3 mm. The earthed roller is usually made from steel covered with a dielectric such as polyester film. The metal blade electrode should be slightly narrower in width (about 5-10 mm) than the film to be treated in order to prevent direct discharges to the roller. The electrical discharge is accompanied by the formation of ozone which oxidises the surface of the film, rendering it polar and receptive to inks. A certain mechanical roughening of the film may also occur due to the formation of micro-pits and this also helps to key the ink. The level of treatment is governed by the generator output and by the throughput of the wind-up unit. Both under and over-treatment are undesirable, the latter causing a powdering of the surface or even the formation of pinholes, brittleness and difficulties in sealing. The time between pre-treatment and printing should be kept to a minimum. This is because the effect of the treatment diminishes with time. Another reason is that the treated surface is sensitive to handing and dust pick-up. One simple test for detecting whether or not the surface has been pre-treated is to run water over it. An untreated surface will immediately repel the water, whereas a treated film will retain the water film for up to several minutes. In between these two extremes a partially treated film will tend to show adjacent areas of good and bad adhesion. The test is satifactory, therefore, only for determining whether the film has been pre-treated but does not show up over-treatment. The peel adhesion test is an improvement on the above and is carried out by applying to the surface of the film a specified pressure sensitive tape (3M No. 851), using a roller. The peel strength is then measured using a tensometer. The higher the level of treatment, the higher the peel strength. A variation on this test also utilises pressure sensitive tape (3M Scotch Tape No. 880) but this time it is applied to a sample of printed film. The tape is firmly pressed onto the surface then rapidly pulled off and the amount of ink removed is noted. Ink removal of not more than 1% is generally regarded as satisfactory. This test is widely used and acts as a useful control test but it does not always detect over-treatment. Ink is forced through a partially masked screen as in screen printing. The ink is transferred to the film from a surface carrying the required design in relief, as in flexographic or letterpress printing. The ink is transferred from a plain surface as in lithography. This works on the following principle: lithographic inks are of a greasy nature and the surface of the printing plate is normally grease repellent except in the area where the design has been etched to make it receptive to the ink. The process has rarely been used with polymer films so will not be mentioned further. This process is basically a stenciling process using a fine mesh screen to avoid the disadvantage of having unprinted areas where the design is connected to the surrounding material as in ordinary stencilling. The screens were originally made from silk but are now usually made from nylon or terylene. Mesh sizes are of the order of 200-300 perforations per inch. Screens are prepared by photographic methods and masked so that they are porous only in the areas where the decoration is required. The screen is supported by a frame which keeps the screen taut and retains the ink supply. A flexible rubber squeeze is drawn across the screen and this forces the inks through the porous area of the screen onto the plastics film. The screen is then moved out of contact with the film which is then dried. Screen printing allows the application of a much thicker layer of ink than other printing methods and it is thus suitable for cases where solid, glossy colours are required. Other advantages of screen printing include ease of training of operators, low cost of equipment and screen, low changeover times and economy on short run work. The main disadvantage is that for multi-colour work it is necessary to use a series of screen stations with provision for drying between each printing station. However, if the colours do not overlap it is possible to use a split screen and print two or more colours at one pass. Letterpress is a printing process in which a raised type face applies the ink to the film surface. The ink has a pasty consistency which the make the process a difficult one to apply to plastic films except stiff films such as rigid PVC and regenerated cellulose which are not so susceptible to damage by the high pressure which have to be applied. This is a high speed method and is the most widely used for the decoration of plastics film. A Thin, fast-drying solvent based ink is applied to the film surface by means of a flexible rubber plate (or stereo) with raised characters on it. This is mounted on a plate cylinder by means of an adhesive. 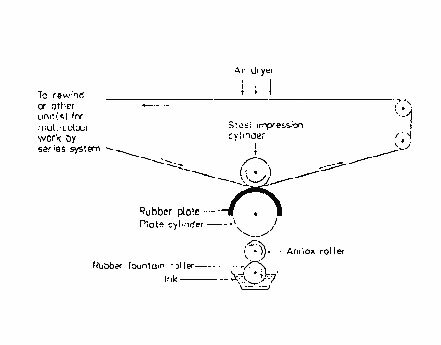 Ink is transferred to the rubber plate from the ink fountain via a rubber inking roller and an anilox roller. The anilox roller is an engraved stainless steel roller which holds ink in the recesses of the design and acts as a metering device to the rubber plate. The process offers a combination of high speed (60-300 m/min) and comparatively low printing plate costs but stereo preparation does not lend itself to the reproduction of very fine half tones. The inks used in flexographic printing are mobile and the solvents volatile so that multi-coloured printing at one pass is possible using several printing heads on a single impression cylinder. Over drying is essential to achieve high printing rates and up to six colours can be printed. To summarise, therefore, flexographic printing has the advantages of high speed, relatively inexpensive plates and short changeover times but has the disadvantage of being unable to reproduce fine detail. This process consists in inking an engraved printing roller which then transfers the ink directly onto the film. The engraved design is made up of a series of tiny cells of varying depth so that differing amounts of ink are picked up by different parts of the roller. Excess ink is removed by a doctor blade. For all practical purposes photogravure printing is a continuous-tone process, for it is only in the light and some medium tones that the cell walls are visible after printing and then only under magnification. The size of the individual dots can be seen from the fact that the screen size used to produce the cells on the roller is about 60 lines per centimeter while means a total of 3600 cells to the square centimetre. Even finer screens are used for high definition work. The principle of the process can be seen by reference to Figure 2. With multi-colour work it is essential to dry between each colour application. After passing through a hot air blast, the film passes over a water cooled roller to prevent transference of heat from the drying chamber to the next printing unit, where an increase in temperature would cause the volatile ink to partially evapourate and dry in the cells of the engraved cylinder before contacting the web. 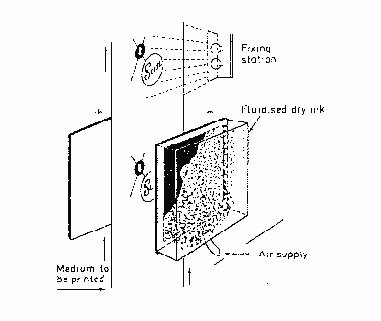 The cooling roller also hardens the ink from the previous station which was rendered tacky by the application of heat sufficient to melt the resin content of the ink. The main disadvantages of photogravure printing are the high initial costs for the etched metal rolls and the printing speeds, which are somewhat slower than those obtainable with flexographic processes. Normal photogravure speeds are of the order of 18-120 m/min. The main advantage of photogravure printing is that it can produce such high quality, multi-colour, fine detail printing. Hot stamping consists in the fusion and release of a special coating from a heat resistant carrier tape and its transfer onto the film. The stamping foil consists of a carrier tape(usually polyester film, glassine paper or cellulose film), a relief layer which is a wax that melts at a predetermined temperature, a metal or pigment coating and an adhesive layer which acts as the band between the imprint and the film surface. The foil is pressed onto the film by means of a heated male die which causes the release layer to melt and fuses the pigment to the film surface. Stamping foils can be made from a wide variety of different waxes, pigments, metals and adhesives and it is essential to inform the foil supplier of the plastics to be decorated so that he can supply the correct foil. There are three variables which have to be considered in hot foil stamping, namely, temperature of the die, the contact pressure and the dwell time. These variables are all inter-related so that actual conditions for each polymer cannot be given. However, the normal temperature range is 100-225Â°C. The principle of hot foil stamping is shown in Figure 3. Fully automatic machines are available with speeds of from 500 to 5000 impressions per hour. Very good definition is obtainable but the method is not suitable for large areas of print. Other advantages are that the print is dry and can be handled immediately after printing and no pre-treating is required even with polypropylene and polyethylene. In addition, the print has good opacity and the finish can range from glossy to matt, with a good range of colours. In this respect it should be noted that hot foil stamping can achieve decorative effects unobtainable by other techniques (e.g. metallic finishes such as gold and aluminium). Apart from the disadvantage of restrictions on area of coverage, the major drawback is the relatively high cost. This is a comparatively recent technique and is only really important as a method which allows the printing of awkwardly shaped objects. The technique utilises an electrically charged stencil consisting of a fine-mesh, electrically conducting metal screen on which the non-image areas are masked. The other component of the system is a conductive backing plate of the same relative size and shape as the screen and placed roughly parallel to it. A finely divided powered ink is applied to the outside of the screen where it takes on the charge of the screen and is attracted, through the openings, towards the oppositely charged back plate. The ink sticks to the plate in a pattern that faithfully reproduces and design in the printing screen. In the same way, any article that is interposed between the plate and screen will also be printed. The image can be fixed by heat, solvent or vapour. The intercepting medium which is to be printed can consist of any material provided it does not interfere with the electrical field. In this respect, articles of high capacitance, such as polystyrene or polyethylene film, can give trouble unless the static charge on the surface is first dissipated. Figure 4 shows the general principles of the process. The printing of plastics films poses many problems which are not present when printing paper. One of these, particularly relevant to the polyolefin films, is their inert surface and we have already discussed the pre-treatment methods which overcome this defect. There remain other problems, however, which are present in the case of all plastics films. The chief of these is the fact thet their surfaces are smooth and impervious unlike those of most papers which, however smooth in appearance, are discontinuous in nature. This means that paper can absorb printing inks and, in consequence, the inks can penetrate into the paper. This has two effects. First, the ink dries quickly and so there is less danger of set-off of ink between adjacent surfaces. Second, there is an ink residue left beneath the surface of the paper after drying as well as on it. Because of the smooth and impervious nature of plastics films printing inks have to be formulated so that they can attack the surface. This gives rise to another problem, namely, excessive attack on the films leading to swelling, loss of mechanical properties or tackiness. Solvent selection by the printing ink formulator is thus extremely important. Inks of this type are absorbed by the substrate as a liquid. They consist, usually, of a pigment (often carbon black) dispersed in a mineral oil and sometimes containing a little gilsonite (a type of bitumen) or rosin. Toners may also be added to increase or modify the colour. A common example of an ink of this sort is that used for news print. This type of ink cannot, of course, be used for plastics films for the reasons already mentioned. Drying by penetration alone is unsuitable, not only for plastics films, but also for the better quality paper where drying would be so slow that set-off would almost certainly occur. Inks are available in which the vehicle consists of a thin mineral oil blended with a drying varnish(based on, e.g linseed oil). Such inks are stable while in the container, or on the machine but when they contact the paper the thin mineral oil is absorbed leaving a stiff paste consisting of pigment and drying varnish. This paste is not dry but it is too stiff to cause set-off. Afterwards, oxidation of the linseed (or other vegetable) oil proceeds slowly, giving a hard film of printing ink. Dryers such as cobalt naphthenate, which accelerate the oxidation reaction, are also added. Where the printing surface has little or no absorbency, even inks of type (2) are unsuitable. Inks based on drying oils and pigments can be used but their adhesion is not usually good without the aid of absorption. A high proportion of a resin is added, therefore, and driers are again used to speed up the oxidation. Inks that dry by evapouration are known as heat set inks. They consist simply of a pigment dispersed in a resin solution solvents are chosen which evapourate rapidly, leaving behind the resin which acts as a binder for the pigment. The last traces of solvent are often difficult to remove because of the sponge-like action of the resin. Modern designs often possess the requirement for overall decoration of a sachet so that the printed area is in or near to the heat seal. Heat resistant inks are required in such instances and are based either on high softening point thermoplastics, such as the polyamides, or on thermosets such as polyurethane. Thermosets are more efficient but pose problems because the resin is formed in situ by chemical reaction of two liquids which are mixed immediately prior to use on the machine. The pot-life can vary up to a matter of days but even so, there usually remains ink on the machine which will set hard unless completely removed by washing down. It is often difficult, too, to estimate accurately the amount of ink necessary for a run and a substantial reservoir of ink may have to be wasted. Silk screen inks may be of the oxidative drying type but the newer rapid drying inks are solvent based and dry by evapouration in which case they probably consist of a resin solution in a high boiling ketone. Both gravure and flexographic inks are solvent based and are, therefore, the evapourative drying type. The solvents normally used for flexographic inks are alcohols or alchol/ketone mixtures. Hydrocarbon solvents cannot be used because they would affect the rubber stereos. A typical flexographic ink, therefore, might consist of titanium oxide as the pigment, together with a coloured toner to give the required shade, plus a low melting point polymer in an alcohol or alcohol/ketone solution. Gravure inks also contain a pigments plus a toner and a low melting point polymeric binder. The solvents used were formerly toluene and xylene but alcohol-based inks are also available and have the advantage of being less odorous. Other general requirements for printing inks for use with plastics films are that they should be unaffected by the content of the package and that they should be flexible. Flexibility is dictated by the fact that plastics films themselves are flexible and the ink would otherwise become detached if the film were to stretch or shrink while the ink did not. Although not strictly a printing process, vaccume metallisation is a means of decoration and so is best discussed in this chapter. The fundamental principle of this process is the heating of aluminium to a high enough temperature to vapourize it. In practice, this necessitates temperatures in the range 1500-1800Â°C. One way of achieving this is to hang short pieces of aluminimum wire onto a tungsten filament which is then heated electrically. This is only suitable for short heating cycles and so is used for metallising plastics mouldings on a batch system. For longer cycles such as are needed for the metallisation of film, the aluminium wire is fed onto a block of metal, usually tantalum. The tantalum is heated by holding it in a carbon crucible across which is arced a high current. Vapourization of the aluminium causes minute particles to be ejected from the surface in all directions. The operation must be carried out in a vacuum, however, in order that the metallic particles can reach the surfaces to be metallised. The metallisation of continuous webs can be carried out in two different ways. One process involves unreeling and re-reeling of the film within the vaccume chamber, while the other consists in passing the film through vaccume-sealed slits with unreeling and re-reeling being carried out from outside the vaccume chamber. Certain films may have to be de-gassed before vaccume metallising because they contain moisture or other volatile constituents, such as plasticisers, which could otherwise cause difficulties during the process. If the normal vaccumisation does not completely remove them before metallisation commences then their continued out-gassing interferes with adhesion of the aluminium giving dull and incompletely anchored coatings. Even if the volatile constituents are completely removed they can make vaccumisation difficult and cause contamination of the pumping system. Films which need de-gassing include regenerated cellulose and cellulose acetate. Since this de-gassing may also remove other, perhaps important, constituents of the film a preferable method of solving the problem may be to seal the surface of the film with a lacquer. It is important, of course, that the lacquer itself should not contain anything likely to interfere with the vaccume. If coloured metallic effects are required the film can be self-coloured or a coloured lacquer can be applied after metallising. Vacuum metallising is carried out mainly for decorative reasons but there is also an increase in barrier properties as can be seen from Table1, which gives results for 15mm oriented polypropylene film. Among the films which have been successfully metallised are polyethylene terephthalate (polymer), polypropylene, unplasticised PVC, regenerated cellulose, cellulose acetate, polystyrene and expanded polystyrene. The last named has a frosted appearance in contrast to the normal bright mirror finish obtained with other films. One of the first films to be successfully metallised in the UK was polyester and this was used for making Christmas trees and garlands. Later applications for metallised polyester films were metallised trim and lightweight mirrors. The market for Christmas trees has now largely changed to unplasticised PVC because of its non-flammability. A whole variety of other uses has been found for metallised films, including electrical uses which require a thin conducting layer on a thin insulator. Such films find many applications in the electronic industry where miniaturisation is the trend. Self-adhesive tapes with a metallised finish are popular for decorating motor scooters with a non-tarnishing imitation of chromium plating. The more rigid metallised films such as PVC and polystyrene can be used in vaccume forming of a variety of different objects. An important factor to be considered here is that if the metallised coating is on the top surface it will reflect some of the heat and the forming cycle will be considerably longer. Conversely, if the metallised coating is on the underside, it reflects the heat back through the film, thus shortening the cycle. Thermosetting resins are defined as those that cure into non-melting, insoluble polymers with the application of heat. Many resins in use today cure by catalytic action and do not require any added heat. Chemistry of thermosets is essentially the same is thermoplastics. The difference is that more reactive sites are incorporated, resulting in three dimensional or crosslinked polymers. A number of mechanisms can be used to create cross linked polymers. The simplest method is to use a monomer with three or more reactive sites. 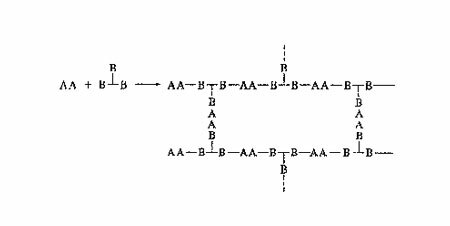 Reactive groups "A" and "B" are combined by means of heat or catalyst that does not actate "C" .The prepolymer can be crosslinked by adding a catalyst that activites the "C" groups. Natural rubber was probably the original thermoset. Rubber latex extract from the rubber tree is primarily polyisoprene. This latex is a straight chain (linear) polymer with double bonds in the backbone. In 1839, Charles Goodyear discovered that latex rubber could be made tougher by blending it with sulfur and heating, and he called the process vulcanization. By accident Goodyear had discovered how to crosslink rubber. This process not only improved strength and toughness but it also increased the temperature resistance. In fact, the vulcanized rubber will not melt. Sulfur content can be varied from 0.5 to about 50 parts by weight of rubber. 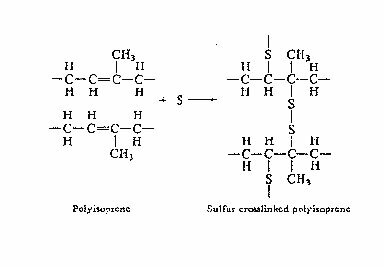 Increasing the sulfur produces more crosslinks, which results in harder rubber. At 30 to 50 parts, the product is a rigid plastic known as hard rubber or Ebonite. In recent years, free radical crosslinking has been used to replace the sulfur vulcanization. Free radical cure improves some of the properties, particularly oxidation resistance. The first reaction is carried out in a batch process with an acid catalyst. A base catalyst is added for the crosslinking (cure) reaction. Cure temperature ranges from 250Â° -350Â°F (120Â°-177Â°C). Phenol formaldehyde is a rigid, brittle, insoluble plastic that on heating chars rather than melts. Properties can be modified by using substituted phenols or higher molecular weight aldehydes. Phenolic resin gives off significant amounts of volatiles during cure. In addition to water,phenol and formaldehyde can be given off. Fillers are added to reduce shrinkage and provide strength. Resin filler mixtures are heated to partially cure the resin and drive out some of the volatiles. This is known as B-staging. Pressure is used during molding to prevent foaming from the remaining volatiles. Melamine reacts with formaldehyde to form cross linked resins similar to phenolics. Melamine resins have been used as textile finishes to form wash and wear fabrics, but they are probably better known as molding materials used extensively in dishes. 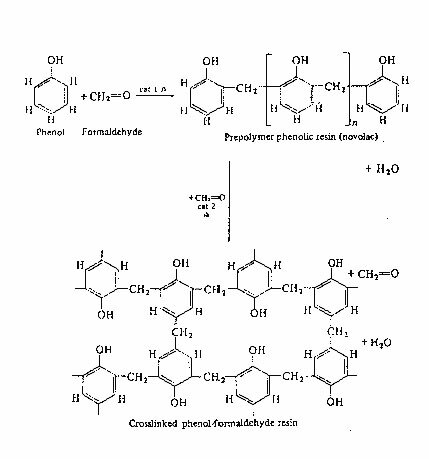 Formaldehyde reacts with urea in much the same way as melamine. The reaction takes place in several steps and lends itself to forming B-stage resins. The general form is shown on top of the following page. 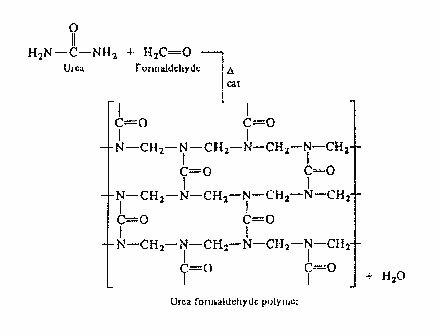 Urea formaldehyde resins are used as electrical insulators due to their arc resistance. Urea foam insulation has shown some success because of the polymer's inherent flame resistance. 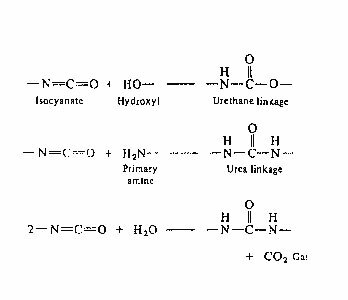 Urea is a low cost starting material which allows the production of inexpensive resins. The unsaturated versions of polyesters open up a whole new field of curable liquid plastics. The basic polymer is formed by reacting a diol with a diacid that contains a reactive double bond. 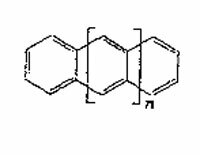 (The form of this type polymer is shown below.) Actual resins may have mixtures of different diacids and diols to control the properties. Polyesters with vinyl groups can be cross linked later with a free radical catalyst. The polyester is typically a solid dissolved in styrene. 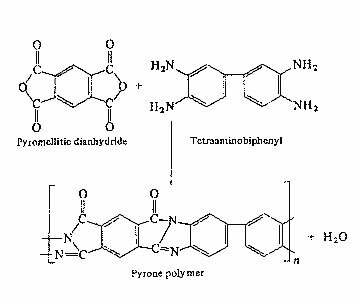 Addition of a free radical curing agent polymerizes the styrene along with the vinyl groups in the polyester. A number of peroxide curing agents are available for initiating polyester resins. Different peroxides give a variety of cure rates and temperatures. Methyl ethyl ketone (MEK) peroxide is normally used for room temperature curing of polyester. Alone it would require about 300Â°F (150Â°C) to activate the peroxide. Activation can be accomplished at room temperature by using a small amount of cobalt naphthanate or other activator. Cobalt naphthaate is often added to the polyester resin by the manufacturer. Caution : Never mix peroxides directly with organo-metallics (such as cobalt naphthaate) because violent reaction can occur; peroxides will decompose very rapidly with high heat generation. Most vinyl reactions are inhibited by air. A was which blooms to the surface is added to polyester resins to overcome this problem. Surface cleaning is advised prior to future bonding operation. Polyester resins are used in large quantities in fiberglass laminates and moldings. Polyurethane chemistry is a whole field in itself and is outside the scope of this book. 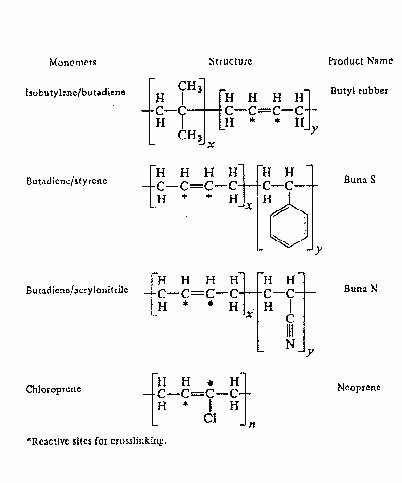 Polyurethanes start with isocyanate groups, which can react with several other types of groups. Reaction with water produces CO2. as a by product. Gas formation can be desirable in foams, but it is a serious problem in elastomers and adhesives because the gas bubbles reduce the strength of the product. Most polyurethane elastomers are made from prepolymers. 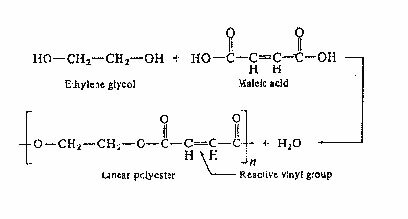 The typical prepolymer is a reaction product of polybutylene glycol and toluene diisocyanate. 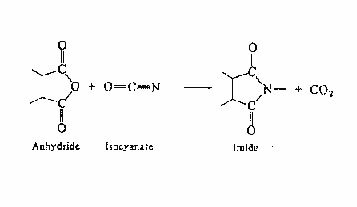 Isocyanate terminated prepolymers can be cured with any number of diamines polyols, or mixtures of both. Amines give the best adhesion and tear strength. 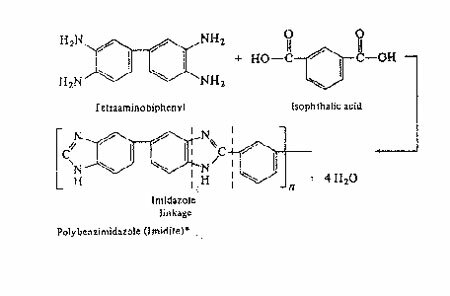 Typical reactions are shown on the following page. MDA gives fast gel times (about 5 minutes). Adiprene L 100 yields a tough non-crosslinked elastomer that melts at about 350Â°F(177Â°C). Many polyols can be utilized in curing polyurethanes., A typical one is shown. 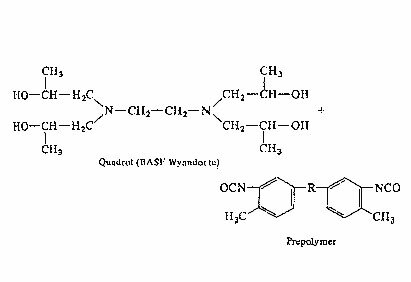 Quadrol has four hydroxyls (functionality 4) which will crosslink the urethane elastomer and increases the temperature resistance. 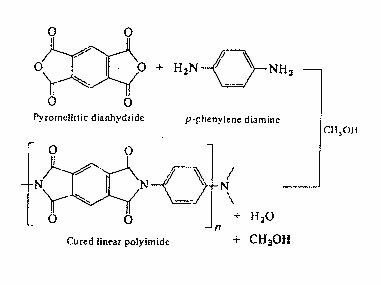 Very stable polymers are formed by reason of dianhydrides with primary diamines. The simplified reaction is shown below. An example of a very stable resin is the following cured linear polyimide. Methanol is used in the reaction to form intermediate structures and is given off during the final cure. Solution resins are produced by this reaction where the CO2 is vented off during the polymerization. Foams can be made using the CO2 as a blowing agent. Polyimide polymers are very stable linear resins. They have long term use temperatures of about 700Â°F (370Â°C) with short term strength to 900Â°F (480Â°C). Various forms are available, such as Dupont's Vespel molded parts and Kapton film. Dupont, Monsanto, Geigy, Upjohn, and others produce laminating molding and adhesive resins. Polybenzimidazoles are similar to polyimides. 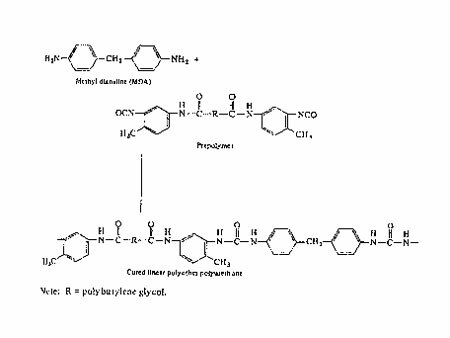 Linear polymers are formed by reating a tetrafunctional amine with a diacid. Polymers with dual bonding along the backbone offer great potential for thermal stability. An ideal structure is shown below. Several ladder polymers have been formed by a process termed "zipping up". 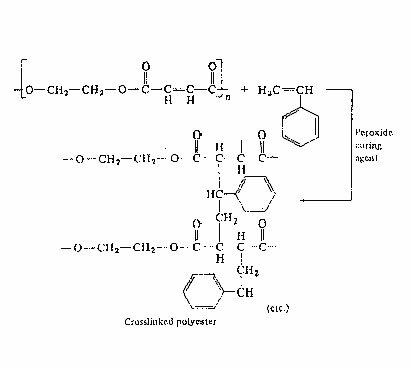 This process involves making a linear polymer with reactive groups along the chain. These groups are later reacted by heat or catalyst. Polyacrylonitrile is an example. Black Orlon is insoluble and non-melting. Decomposition occurs above 1300Â°F (700Â°C). Ladder or partial ladder polymers can be prepared by use of tetrareactive monomers. Some of these are suitable for laminating or foam formation. An example of such a polymer is the pyrone. Thermoforming, as the name implies, consists essentially of forming a heat-softened sheet or film, either into or around a mould. The principles are the same, however, so that these will be described, together with applications for either film or very thin sheet (i.e. close to the film/sheet borderline). There are basically three types of thermoforming, namely, vacuum forming, pressure forming and matched mould forming. In its simplest form, vacuum forming equipment consists of a vacuum box with an air outlet and a clamping frame, a mould, a heating panel and a vaccum pump. The mould, which is partly hollow underneath and is perforated, is placed over the air outlet. The thermoplastics sheet is then placed over the open top of the vacuum box and securely clamped by means of the frame, giving an airtight compartment. The sheet is heated until rubbery, the heater is with drawn, and the air in the box is rapidly evacuated by the vacuum pump. Atmospheric pressure above the sheet forces it down into close contact with the mould where it is cooled sufficiently to retain its shape. The clamping frame is then released, the formed sheet is removed from the mould, and the excess material trimmed off. The sequence is shown in Figure 1. There are a number of variations on the simple technique outlined above, including drape forming and plug assist. In drape forming the mould is mounted on a piston within the vacuum box. The piston rises and pushes the mould into the heat-softened sheet, immediately prior to the vacuum being applied. This gives a certain amount of pre-forming, and so lessens thinning of the sheet at the corners of the mould. Plug assist is particularly valuable for deep forming and consists of a hydraulic ram carrying a rough pre-form mould. This is pushed down into the top of the sheet, immediately prior to the vacuum being applied. An interesting variation on vacuum forming utilises thin film rather than thick sheet. The articles to be packaged act as their own moulds, the process being known as skin packaging. The articles are placed on a porous board, the whole assembly being then placed in the skin packaging equipment. Film is drawn from a reel and clamped in a frame set above the loaded board. A cutter severs the film from the reel, and a heater moves above the film. After a set period the heater retracts and the frame descends, draping the hot film over the articles on the board. A vacuum is then applied beneath the board and the film is drawn around the articles to be packaged and into intimate contact with the board, forming a permanent bond. This is similar to vaccum forming with the exception that a positive air pressure (relative to atmospheric) is applied to the top surface of the sheet. As in vaccum forming, this has the effect of forcing the heat-softened sheet into contact with the mould. The main advantage is that the pressure on the sheet can be greater than in the case of vaccum forming which is, of course, limited to atmospheric pressure. Pressure forming thus gives better reproduction of mould detail. In this method the heated sheet is formed into shape by trapping it between matched male and female moulds. The mould detail, as one would expect, is even better using this technique but it is more expensive in tooling costs and the mould halves have to be made to tight tolerances. Thermoforming techniques are well adapted to form/fill/seal operations. In one type of machine, blisters are formed to a profile roughly similar to the article to be packaged, the article is fed into the blister and the blishter sealed to a reel of fibreboard. The individual packages are then trimmed and separated. These machines are used for the packaging of high sales volume items such as reels of cotton, razor blades, etc. The other main area of theromoform/fill/seal is foodstuff's including items such as cream, jam and other preserves, sauces, cheeses, etc. The thermoplastics web is passed through a foming stage, the formed sheet is then indexed under a filling head and the filled compartments are lidded by heat sealing another web of material on top. The filled and lidded containers are then cut and separated. The reel of material used for lidding is normally pre-printed and may be a thermoplastics or a thermoplastics coated paper or aluminimum foil. A somewhat similar operation is the packaging of tablets or pills into 'push-through' blister packs. A multi-cavity mould is used and the tablets or pills are automatically distributed into the formed cavities in the sheet. The aluminimum foil lidding web is then brought down over the filled plastics web and heat sealed to it. The tablets are eventually dispensed by pushing them from the plastics side, through the aluminium foil. The machine variables of greatest importance are heating, cooling, and mould design. Other items include trimming and, sometimes, printing. The usual form of heating employed is infra-red, normally the ceramic type having a heating wire element sealed into it. Many machines have heater panels in which a large number of separate elements are wired up in 'chessboard' fashion. This allows more heat to be supplied to certain parts of the sheet, as required. The heaters are positioned fairly close to the sheet in order not to waste heat but too close an approach must be avoided other wise a heater pattern may be impressed on to the sheet surface. All plastics are poor conductors of heat and so the moulded sheet should be removed from the mould as soon as its is dimensionally stable. The cooling of thick mouldings may often be assisted by air blasts or water-mist sprays but this is not normally necessary with thin sheet and film. For small runs and prototype work, thermoforming moulds can be made from plaster or wood and are, hence, very cheap. For long run production work, however, epoxy resins or aluminium are preferred. Deep and sharply angled corners should be avoided as they cause local thinning of the sheet. The sides of the mould must be tapered to facilitate removal of the moulding, particularly with male moulds. The forming of undercuts is possible using moulds with removable sections but this means a more expensive mould and a longer moulding cycle. Trimming may be carried out by a variety of equipment ranging form a simple knife to a complicated cutting press. Roller presses, for example, are widely used in conjuction with a cutting board. Printing of the finished formed containers is usually possible but may be a slow process, and hence expensive. Printing of the sheet before forming can also be carried out, the design being destorted in such a way that the appearance after foming is as required. One way to determine the distortion necessary is to form a sheet on which a grid pattern has been printed while the sheet was flat. The amount of distortion on forming, at various points on the surface, can then be determined. Most thermoplastics can be thermoformed but the case of forming varies considerably. In addition, the end-use must be taken into account when considering the choice of material. The polymers most commonly used for thin-wall thermoforming are considered, briefly, below. PVC sheet has good clarity, rigidity and chemical resistance. Very good formings, with good mould detail, can be obtained from even the thinner sheet gauges. It is used of blister packs and for many food packaging uses, particularly chocolate and biscuit box inserts, and for margarine tubs. Because PVC is self-extinguishing it is particularly useful in applications such as aircraft food trays. This is the most commonly used therforming material in the United Kingdom. It is easily formed and gives fairly rigid containers. One of the largest outlets is for vending and other disposable drinking cups. It is also widely used for yoghurt and cream pots, and for ice-cream containers. Toughened polystyrene is translucent and cannot be used where good clarity is required. Normally, the clear basic polysyrene is too brittle for use but if the clear sheet is biaxially oriented it is effectively toughened and can be thermoformed to give crystal-clear containers. It is difficult to thermoform because of the strain present in the sheet but it can be pressure formed on special equipment. The main problem with this material is that the foam structure gives it an even lower heat conductivity than normal. It is difficult, therefore, to heat the sheet right through without overheating the surface. The sheet is, therefore normally heated from both sides at once. Expanded polystyrene sheet is opaque and has an attractive surface sheet. Application include trays for pre-packaging fruit, vegetable and meat, as well as for the transport of delicate electronic components. The thermoforming properties of this material are similar to those of toughened polystyeren (which it resembles chemically) but it is more expensive. It is also tougher and can sometimes be used in thinner gauges than toughened polystyrene, so reducing the price differential. This material can be thermoformed although it has a tendency to sag when heated, and the finished formings are also rather limp. Thermoforming is easier with this material than with low density polyethylene because of its increased rigidity and hardness. Double sided heating is usually desirable because the sheet expands appreciably on heating to give folds which may weld together, given time. In addition to fast heating accurate control of temperature is essential. In the USA high density polyethylene has been used for the manufacture of margarine tubs. Polypropylene has greater stiffness and is more resistant to stress cracking than are the polyethylenes, and it is more resistant to high temperatures. The forming properties of polypropylene are similar to those of high density polyethylene and, in general, the same methods can be used for both materials. Application are usually in areas where the thermoformings need to be resistant to boiling water or to moderate sterilisation temperatures. At the other end of the scale, polypropylene is not so suitable as high density polyethylene because the impact strength and other physical properties decrease rapidly with decreasing temperature (below about 0Âº C). Cellulose acetate possesses excellent clarity and is readily thermoformed, giving rigid mouldings particularly suitable for blister packaging. It is rather expensive but is used where high class formings are required. Temperature control is critical because too high a temperature causes surface defects such as blistering while too low a temperature leads to 'milkiness' in the finished forming. One disadvantage of cellulose acetate is its dimensional instability in conditions of changing humidity, due to moisture pick-up from the atmosphere. Cellulose acetate formings are easily fabricated either by adhesives or by solvent welding. This material is similar to cellulose acetate but has superior dimensional stabilty. Like cellulose acetate it possesses good rigidity and clarity and is easily fabricated by adhesives and by solvent welding. Polycarbonate can be thermoformed but needs higher forming temperatures than the other materials previously mentioned because of its higher softening point. It possesses great clarity and a very high impact strength. It is particularly useful for the manufacture of blisters for hard, sharp articles such as hardware. A big disadvantage of thermoforming is the time and money wasted in double heating, i.e. heating of the granules followed by reheating of the sheet. Thermoforming of the newly extruded sheet can be carried out but this introduced problems in matching the speeds of the separate processes. Changeovers are also expensive because the extruder must be shut-down as well as the moulding process. Work has been carried out, therefore, on the forming of cold or only slightly heated sheet using techniques adapted from sheet metal working. These techniques are more applicable to sheet rather than film but some success has been achieved with the more rigid materials such as ABS, polycarbonate and rigid PVC.